SharePoint 2010 ups the ante with it's developer tool integration, providing developers with rich development time, testing and application lifecycle support. 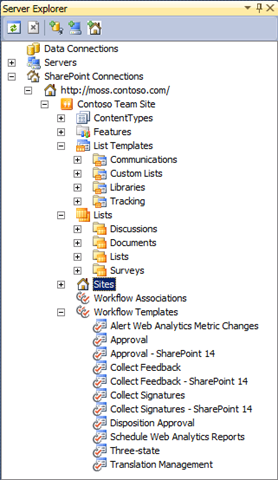 This article provides an overview of the new features and improvements along with powerful out of the box capabilities for improving the developer experience with SharePoint 2010. SharePoint 2010 represents a significant step forward for SharePoint as a development platform not only within the enterprise, but beyond. Alongside powerful new features in SharePoint itself, the richness of integration with Visual Studio 2010, vast improvements in SharePoint Designer 2010 and new capabilities in Visio 2010 and the ability to use Windows Vista and Windows 7 as a development environment make SharePoint development more productive and accessible. This article provides a walk through of these new capabilities and improvements. List Instance, Web Part, Application Page, Workflow Association Page, Workflow Instantiation Page, Global Resource. Click to view the new SharePoint Project Types in Visual Studio 2010. For each Project Type, a Wizard walks through the necessary options, before configuring the development environment for use. Another powerful new capability for SharePoint development is the Server Explorer, which now includes support for SharePoint settings and artefacts. Many of you may remember my rant a few years ago about the new for a “SharePoint Developer Edition”. The great news is that running SharePoint 2010 (both SharePoint Foundation and SharePoint Server) will be possible on Windows Vista and Windows 7. No longer are developers forced to use Virtual Machines to develop with SharePoint. Of course, because SharePoint 2010 is 64-bit only, this will require a 64-bit version of of Windows on the client, for “client development”. So get your laptops ready now, by ensuring you are running X64! 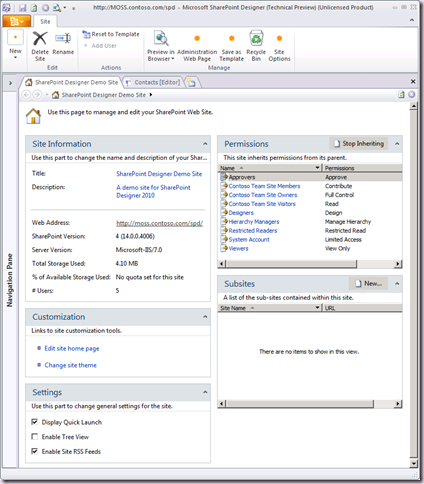 SharePoint Designer 2010 features a huge breadth of new features and capability. More than can be covered in this overview. SharePoint Designer 2010 is no longer a tool primarily focused towards page customisation, but rather a full fledged editor for SharePoint assets of all shapes and sizes. For developers an important new capability is that SPD is now a first class citizen in the application development lifecycle. 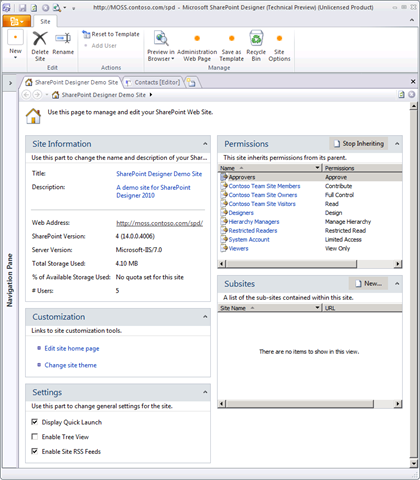 Once an application has been created (or more likely prototyped) in SPD and the SharePoint Web UI it can be packaged as a WSP and then imported into Visual Studio 2010. Another useful capability is that of administrative control of what type of SPD usage will be allowed across a Web Application, or on an individual Site Collection level. Now administrators can enable those crazy business analysts to go for their life without fear! SharePoint Designer 2010’s UI has received an overhaul with the Fluent UI and a task driven approach to SharePoint customisation. 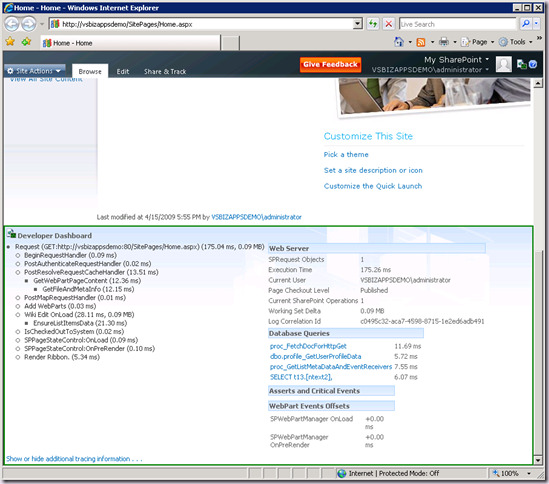 The following screenshot shows the initial Site Dashboard. Workflow development in SPD is also enhanced significantly allowing custom workflows which do not require custom code. 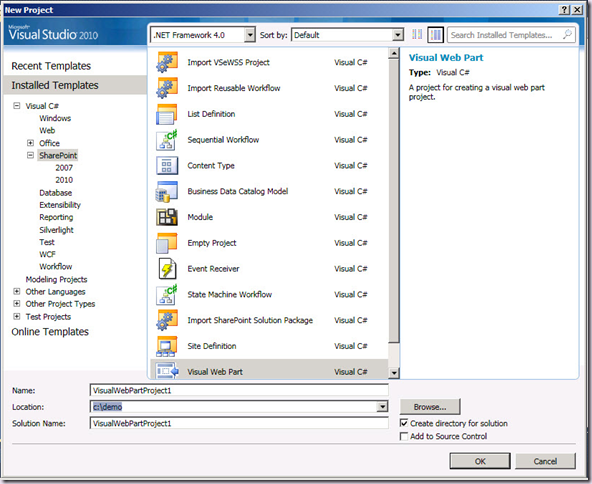 The resulting WSPs can then be imported into Visual Studio 2010 for enhancements or changes. 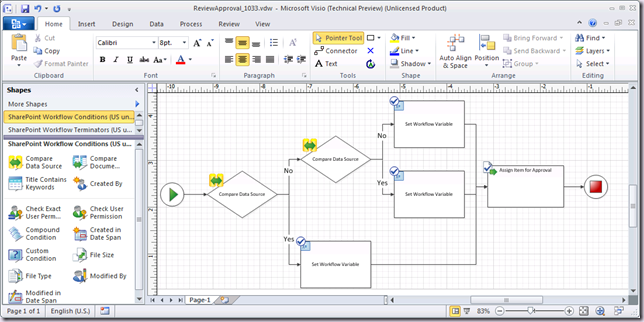 Another exciting enabler is that SharePoint workflows can now be designed in Visio 2010 and then imported into SPD. 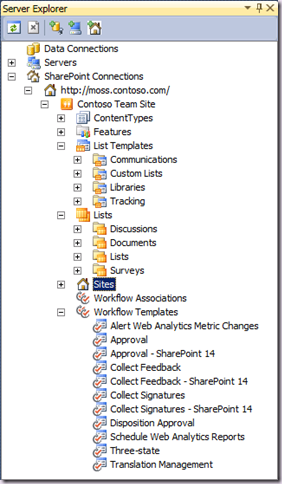 One of the problems commonly associated with SharePoint Development is that one dodgy widget can tank your deployment. It really doesn’t matter where that widget comes from, it might be a ISV, CodePlex, your preferred supplier or an in house developer. Carnage is just a step around the corner should any of these not be developed using appropriate practices, lifecycle controls and quality assurance. In addition in most environments, there are many widgets across the deployment. How they interact, especially under peak usage is a key concern for many. 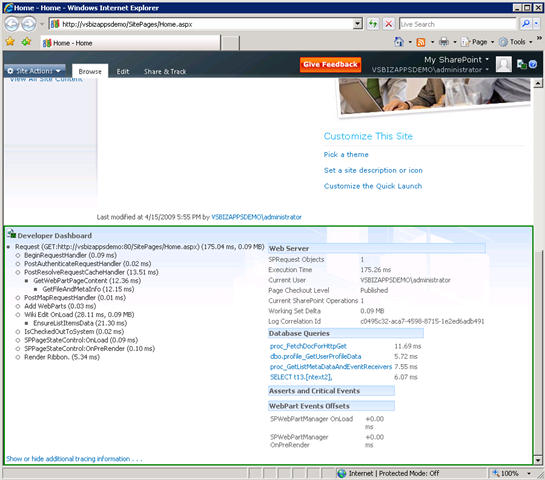 SharePoint 2010 addresses this problem space with the Developer Dashboard, a new feature in the Web UI which enables you to display performance information and a function level trace related to the code executed. For more information on the Developer Dashboard, check out my buddy Bob Fox’s article. Due to SharePoint 2010 development being a fully fledged citizen in Visual Studio 2010 and the ability of SharePoint Designer to produce WSPs, true application development lifecycle is now possible. SharePoint projects can now be tightly integrated with Team Foundation Server without the requirement for scripting and automation effort out with the core tool set.